Original Trade Paperback. The exciting debut of a steampunk masterpiece from legendary game author and creator of the staple steampunk role playing game, Space: 1889. The stunning unveiling of a perfectly formed steampunk past, from an author who helped define the genre. London 1888. His Majesty's airships troll the sky powered by antigrav liftwood as a cabal of Iron Lords tightens its hold on a Britain choked by the fumes of industry. Mars has been colonized, and clockwork assassins stalk the European corridors of power. And somewhere far to the east, the Old Man of the Mountains plots the end of the world with his Forever Engine. Enter Jack Fargo. Scholar. Former special forces operator in Afghanistan. A man from our own near future thrust back in time--or to wherever it is that this Brave Victorian World actually exists. Aided only by an elderly Scottish physicist, a young British officer of questionable courage, and a beautiful but mysterious spy for the French Commune, Fargo is a man on a mission: save the future from irrevocable destruction when the Forever Engine is brought to full power and blows this universe, and our own, to smithereens. Frank Chadwick is a the New York Times number one best-selling nonfiction author of over two hundred books, articles, and columns on military history and military affairs, as well as over one hundred military and science fiction board and role-playing games. His game Space: 1889 was the first Steampunk game and remains a cult favorite. His other game writing credits include legendary fantasy game En Garde!, groundbreaking SF role playing game Traveller: The New Era and many others. 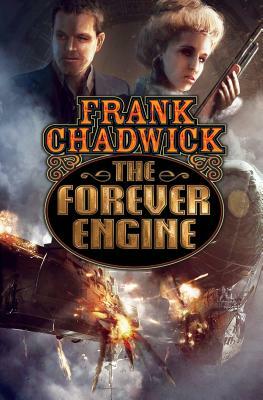 Chadwick's SF novels include science fiction adventure How Dark the World Becomes and steampunk masterpiece The Forever Engine, both from Baen Books.